Swami Chinmayananda is the founding Father of Chinmaya Mission, World-wide. He was one of the world’s foremost Vedantic scholar and one of India’s most respected spiritual leaders. A gifted speaker, Swami Chinmayananda built an intense rapport with his audiences and communicated the teachings with vibrancy and wit. He taught Hindu philosophy in its most ancient and purest form, Vedanta, as it has been passed on from teacher to student since time immemorial. 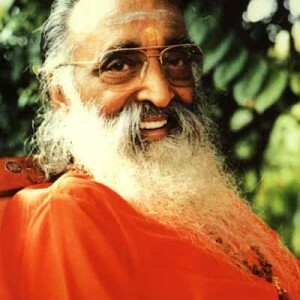 Swami Chinmayananda was born in Ernakulam in Kerala, South India, in May, 1916. He began his study of Vedanta as a skeptical journalist, bringing with him the secular knowledge gained through degrees in science, literature and law. After spending many years in the Himalayas under the tutelage of Swami Sivananda and Swami Tapovanam, he started spreading the joyous vision of Vedanta, which was shrouded in rituals, secrecy and Sanskrit, to the inquiring men and women around the world. Swamiji established Centers for Learning called Sandeepanys in several locations in India. Young aspirants who received the call to devote their lives to the study of Vedanta, received intensive education in the scriptural studies while living a highly disciplined life. The students who graduated from these institutions as Brahmachari-s and Brahmacharini-s went into the world to spread the knowledge to all seekers. Some students received sannyasa (order of monks) from Gurudev. Thus over 200 teachers were trained to teach Vedanta in India and abroad. He had also established schools, colleges, Hari Har Schools for the under privileged, old-age homes for the senior citizens, hospitals, clinics, temples, community outreach programs, in Sidhabari in the Himalayas, to name a few of the social upliftment programs.